Good morning! Brian and I started the morning out right with a mid-week training run. I'm pretty proud of us, we got up at 6am and were on the road by 6:15. It was only 25* outside!!!!!!!!!!! Absolutely frigid at first, but we got used to it quickly after we started our run. We did a 1/2 mile warm-up, 1 mile run at an easy 10-minute pace, and 1/2 mile cool-down. It was only a 28 minute workout but it felt great to get up so early and I was completely awake and refreshed by the time we got home. 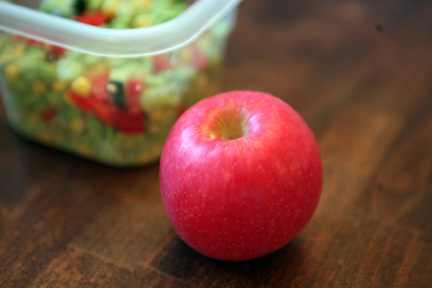 I'm prepared for another busy day at the office with a filling lunch. 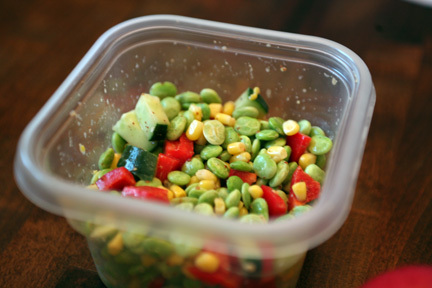 I made a lima bean + corn salad that I found in a Self magazine a couple of months ago. 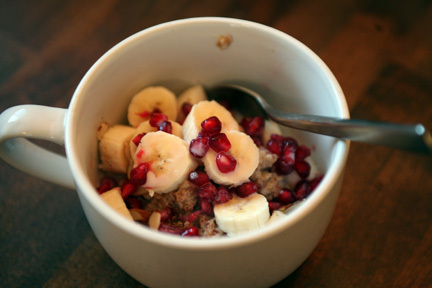 I was unsure of it at first but its actually really good and completely filling...I've made it several times since. Once veggies are thawed and at roughly room temperature mix them all together. Whisk the olive oil, balsamic and mustard together and toss with veggies. 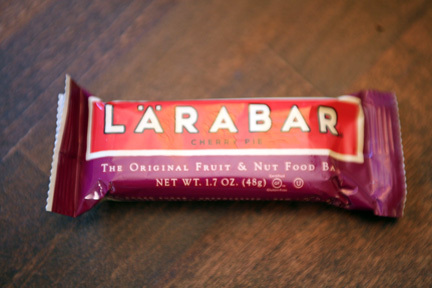 And for a snack I packed a Larabar, cherry pie flavor. Ok, time to get tons of work done! It may be a late dinner post tonight.... I'm hoping to finish work by 8:00 so that I can go to CLAW, the Charlottesville Lady Arm Wrestlers. There's a match tonight and it is so much fun to watch! Plus, my friend Krisin aka TinkerHell is one of the defending champions... :) You should check out their blog if you have time...very entertaining!